Middle Gable is accessed via its garden, which leads to the beautiful wooden front door. Inside the house, a small entrance hall leads into:	Living room: A grand room, which has been newly refurbished in a traditional style, enhancing the abundance of period features, including stone mullion windows, a large fireplace with wood-burning stove, wooden beams and a centuries old alcove. The refurbishment includes a limestone flagged floor, with underfloor heating, and the provision of a flat screen satellite TV and Blu-ray home theatre system with an iPod docking station.The living room then leads into the Inner Hall, which in turn leads to:	Shower room: Contains a shower, basin and toilet;	Kitchen/dining room: The kitchen is well equipped, including a cooker with hob, microwave, dishwasher, fridge, freezer and washer dryer. There is a good sized dining table, with five chairs, and the layout of the room ensures that all guests can socialise whilst cooking is in progress.Returning to the Inner Hall, a grand wooden staircase leads up to the first floor hallway, off which are:	Bedroom 1: The initial highlight of the room is the spectacular super-king size four poster bed and this impressive room also has what is believed to be the original wooden flooring, stone mullion windows and the original "wig and gown" cupboard. There is a flat panel satellite TV in the room;	Bathroom: Contains a bath with shower attachment, basin and toilet.The staircase then continues up into the gable of the house, giving access to:	Bedroom 2: A very spacious, dual aspect eaves bedroom, with beautiful original wooden beams. The room contains three single beds, two of which can be pushed together and one of which doubles up as a sofa (it is a full size adult bed, however).Heading back downstairs and out of the front door, the lovingly cared for open plan gardens spread out in front of you. In Middle Gable's garden, extending from the front of the house, there is a bench, for relaxing and looking out over all the gardens, as well as a paved seating area, which contains an outdoor table and chairs. At the end of the garden is a double garage for guest use. 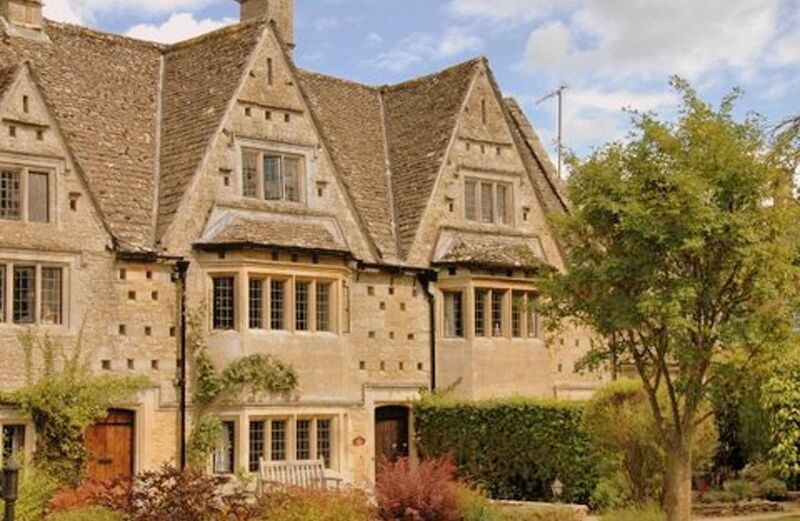 Middle Gable is one of the most picturesque and historic properties in the Cotswolds, forming part of an original 17th century manor house, dating from the time of the English Civil War, over 350 years ago. This grade II* listed property sits in peaceful gardens, in the heart of the famous Cotswolds market town of Bourton-on-the-Water, often referred to as the "Venice of the Cotswolds". This lovely town has numerous shops, restauarants and pubs, and is ideally located for exploring the entire Cotswolds region and beyond. The house has been sympathetically refurbished and retains a wealth of character features, including dovecotes (square holes on the outside wall, originally intended to house doves or pigeons), stone mullion windows, wooden beams, a grand fireplace, original wooden flooring and a "wig and gown" cupboard, to store the wigs and gowns worn by people of the period. Complementing these period features, Middle Gable has modern facilities, including wireless internet access, two satellite TVs, a Blu-ray home theatre system and a well equipped kitchen. Middle Gable sleeps up to five people, in two bedrooms: two in a spectacular four-poster bed in bedroom 1 and three in single beds in bedroom 2. There is a bathroom and a shower room. The living room and both bedrooms look out over beautifully maintained gardens, which include a paved seating area for Middle Gable guests, and there is off-street parking for two/three cars, a distinct advantage in Bourton-on-the-Water. The layout of the house makes Middle Gable an ideal retreat for a family or a group of friends. Thank you for your feedback, and we are so pleased that you had a lovey time at the wonderful Middle Gable. We are sorry for any confusion with the booking process and we are looking at ways to improve this with HomeAway and have taken your comments onboard. Currently, the process is that the HomeAway service fee is taken from the card at the time of booking, and Character Cottages then take payment for the accommodation rental and provide all documentation for the trip. We will always work with guests to explain the process and reassure them over any concerns they may have. We look forward to helping you with another trip to the Cotswolds in the future. Was very impressed with quality of cottage, furnishings, and amenities. Cate did a very nice job putting everything together. Wonderful location, both in terms of the village, and in terms of other sights in the Cotswolds. Was excellent "value for money". After arrival, owner called me to check up and make sure everything was good. This was much appreciated and shows the attention to detail that made this such a nice stay. Wow, thank you for your wonderful review for Middle Gable, Thomas. We're pleased to hear that you enjoyed your stay and we hope that you visit again soon! We were a group of four staying for four days. This is a beautiful property, well-maintained, beautifully situated and well-equipped for everyday living. I highly recommend it. Thank you for your delightful review, Sallie. We're pleased to hear that you all enjoyed your stay at Middle Gable. We hope that you visit again soon! Wonderful property, very convienient for area attractions. Gardens are a delight. Thank you for your wonderful review for Middle Gable, Norman. We're pleased to hear that you enjoyed your stay. We hope you visit again soon! To stay in Middle Gable is a privilege. A beautiful period building, clean and well, maintained in the heart of a picturesque village. Walk a few hundred yards to the center of Bourton and you have the river with five pretty bridges surrounded by some very nice bars and restaurants. Food and drink in the village was plentiful. The house is stunning, beams, low doorways, beautiful staircase, period fittings - comfortable beds, good kitchen, etc. The owner was very personable, provided good customer service and was easily contactable. We found there to be plenty of space for two couples. There were an abundance of walks to enjoy around the village. Would highly recommend to the discerning. Car: Bourton is located approximately 1 mile away from the A429 (Fosse Way) and is easily accessed by car. Train: The nearest railway station to Bourton is Kingham (approximately 8 miles away), which has regular, direct services to London Paddington, with a typical journey time of approximately 90 minutes. Plane: Birmingham International Airport: 50 miles, approximately 60 minute drive; Heathrow International Airport: 73 miles, approximately 90 minute drive; Bristol International Airport: 66 miles, approximately 90 minute drive.